Colourful stalls. Deals and last-minute gift ideas. Booming music. Teeming crowds. Pan chicken and other delicious fare. This is but a snapshot of what the typical Gran’ Market (Grand Market) looks like, in every major town across the island. Gran Market, which takes place on Christmas Eve, is said to have its roots in the time of slavery, as one of the only days our ancestors could gather, socialise and sell items they had made. The contemporary Gran’ Market is a community fair characterised by food, street dancing, crafts and music. 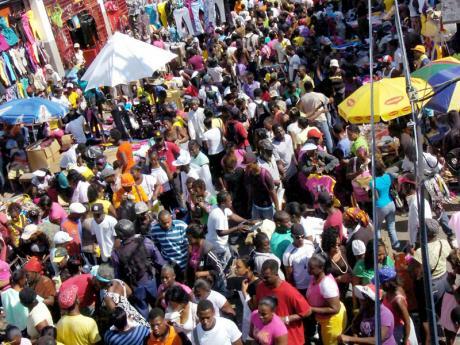 In the past, the weekend before Christmas and particularly on Christmas Eve and Christmas Day, markets all over the island were awash with vendors selling small toys, firecrackers, balloons and sweets of all kinds ­ pinda (an African word for peanut) cakes, grater cakes and peppermint sticks. Oranges and even American apples were distinctive features of the Gran’ Markets. Sorrel, chocolate tea and coffee flowed, as did the Christmas carols and a merry banter between vendors and customers. On Christmas Day, some markets were decorated with streamers, large accordion-style bells, and balloons. Many were decked out in fancy clothes, including bright hats purchased upon entering the Gran’ Market. Everyone came to town for Grand Market and the celebrations lasted throughout the day and well into the night. Are you going shopping at Gran’ Market tomorrow? Check out our handy shopping guide! Read more about other Jamaican Christmas traditions here.